Tip-off your weekend with a trip to Tourney Town presented by Capital One. Tourney Town is a FREE festival jam packed with special appearances, autograph signings, interactive games, giveaways, basketball contests, a professional development series and more. All times local, eastern. All events, times and locations are subject to change. The Capital One Cup Fan Zone is the place for fans to test their skills in various sports including softball, soccer and lacrosse. Exclusive prizes will be awarded for fans who knock it out of the park! Be sure to check it out! The Coca-Cola Kitchen is a unique and entertaining gathering place to enjoy and share some amazing Coke & Food during the tournament. It will be serving up delicious ice-cold Coca-Cola perfectly paired with freshly made cuisines prepared on-site by local chefs. Come by the AT&T booth to shoot some hoops, play corn hole, relax and recharge at our charging station. Associates are available to assist if you have any needs for your wireless, premium TV or internet service. You can also score some swag while spending time in the AT&T area! GEICO, official partner of the NCAA, invites you to join the fun in Tampa! Come check out any of GEICO’s three unique photo opportunities to commemorate the event and earn event swag! The Tourney Town Kids Zone consists of non-stop activities as well as occasional programming throughout the Tourney Town weekend. The Kids Zone will include a ninja obstacle course for kids to test their scaling & balance skills, 4 building block tables for STEM stimulation and self-expression and mini basketball hoops so they can be just like their favorite NCAA athletes! Capital One Center Court will be the place to be for Tourney Town feature presentations this year. Center Court activities will include all the Women’s Final Four band and cheer competitions, mascot challenges, and pep rallies. Be sure to check-out all the live basketball competitions as well as special appearances from Women’s Basketball Hall of Fame Inductees, the WBCA All-America Team, and Lady Legends. Enjoy a photo opportunity with the NCAA championship trophy and 2019 bracket. The Women’s Final Four Championship teams’ autograph sessions will be held inside of Tourney Town on Saturday, April 6 at 2:45 and 4:50 p.m. Other Autograph Sessions will include the WBCA Coaches All-America Team, Lady Legends, Women’s Basketball Hall of Fame Inductees, as well as the Celebrity Shootout participants. The Women’s Final Four Locker Room allows fans to get an inside look at what goes on before and after the game. Fans will be able to see artifacts from the Final Four teams and collaborate with other fans to complete a sticker mosaic to recreate their favorite Final Four team’s logo! For the first time at Tourney Town, the History of Women’s Basketball area will allow fans to learn and engage with several facets of the game. These include; The development of the jersey, Women Final Four media guides throughout the years, Women’s Basketball Hall of Fame Coaches, First 100 Years of NCAA Women’s Basketball History, NCAA Final Four History, speeches from coaches, and artifacts from the Women’s Basketball Hall of Fame. The Beyond the Baseline Lounge is the NCAA Women’s Final Four’s three-day professional development event series designed to empower and equip women in sport and business with tools necessary for personal and professional success. Featured guests include prominent figures in sports and business, Olympic medalists, professional athletes, and much more. You won’t want to miss it! The Bracket Wall is a large wall with basketball hoops in the form of the tournament bracket. Guests can compete to the middle of the wall by shooting against the clock. Volunteers stationed here are busy timing the games, keeping score, and shagging lots and lots of missed shots. 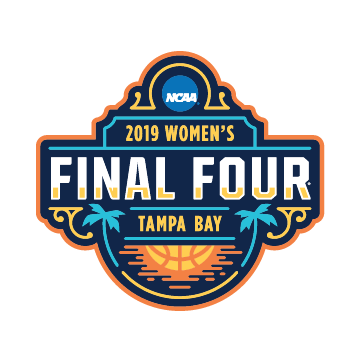 Visit the NCAA Authentic Team Store to purchase the best Women’s Final Four apparel in Tampa. Browse the large selection of men’s, women’s and youth apparel items, as well as numerous novelty items to complete your entire wish list at this one location! The Kay Yow Cancer Fund is again proud to be a part of the 2019 NCAA Tourney Town. They will have a location on site where fans and visitors can purchase official Kay Yow Cancer Fund merchandise and apparel and find out more about this 501 (c) (3) non-profit's work and mission. The Fund was named and founded by Naismith Hall of Fame Coach Kay Yow, prior to her passing in 2009. As the Official Charity of the Women's Basketball Coaches Association (WBCA), hundreds of games and events across the country benefit the mission set forth by Coach Yow, to raise funds for the Kay Yow Cancer Fund for research grants, serving the underserved, and bringing together the women's basketball community for a common cause. The Women’s Basketball Hall of Fame will be promoting the hall of fame along with featuring information on the Class of 2019. The WBHOF will induct its 20th group of inductees, on June 8th in Knoxville Tennessee. The eight members of the Class of 2019 are: Beth Bass, Joan Cronan, Nora Lynn Finch, Ticha Penicheiro, Ruth Riley, Carolyn Bush Roddy, Valerie Still, and AIAW. Pledge to be a responsible college basketball fan! Autograph the responsibility banner, your pledge never to drive drunk and always to have a safe ride home. You will receive a free souvenir photo and be entered to win an NCAA Women’s Final Four prize pack. Responsibility Has Its Rewards! 2,500 School age children from around the Columbus area will come experience Tourney Town on Friday, April 5. Schools will be rewarded for their hard work throughout the year, as well as hear stories read by NCAA student-athletes. On Sunday, April 7, The World’s Largest Game of H-O-R-S-E will allow several hundred fans a once-in-a-lifetime opportunity to compete head-to-head with a NCAA and WNBA basketball legend on center court of Tourney Town. See yourself on the video board, hear the cheers of the Women’s Final Four cheerleaders, share high-fives with the mascots, match the shots of legend to stay in the game and for a chance at great Women’s Final Four prizes while you live out your Final Four basketball dreams. On Friday, April 5, come cheer on your favorite local celebrities & Basketball Legends in this Team Shootout.